Note the date. November of 2000. I talk about having run 20 marathons. I’ve run 45 now and I still feel the same way. The monuments to my childhood were all over my parent’s house: a plaster cast of my hand, the Valentine’s card I made. My home is filled with similar monuments to my son’s childhood: a wreath made of rotini pasta that hangs on the door every Christmas, the rock on which felt feet, head, and tail are glued in a shape that looks–if you have imagination–very much like a turtle. They are prized possessions. My home is also filled with monuments of my return to childhood, to a time of play and joy: finisher’s medals and photos, race t-shirts, a second place trophy from a duathlon where only two males competed in the 45-49 age group. These too are prized possessions. I’m always interested in what other runners do with their medals. Some display them ceremoniously in glass-covered cases with their race number, shirt and photo. I don’t know how these people do it! How do they find the time? My medals are looped over the bedroom doorknob. Why? Because that’s where I put them as I unpack after a race weekend. I come home, empty the suitcase, and hang the medal on the doorknob. Unceremonious? Maybe. But as the number has increased, the medals have become sort of like a wind chime. Most of the time I don’t notice them, but when I move the door, their clanging together reminds me of how much I have accomplished. After completing over twenty marathons, the ribbons are so thick that it’s impossible to turn the doorknob. I’ve had to start hanging the medals on both sides of the knob. Their weight makes me worry about the strength of the door hinges. The last thing I want is the door crashing to the ground in the middle of the night! Recently I was asked if, after so many marathons, it gets any easier to run one. It may for some, but not for me. Sure, I understand the distance better, I know not to blast off in the early miles, I recognize the brain fade in the middle miles, and I’m not surprised by the fatigue in the later miles. But, like cats, no two marathons are ever exactly the same. And the lessons learned in one may be of no use whatever in the next. 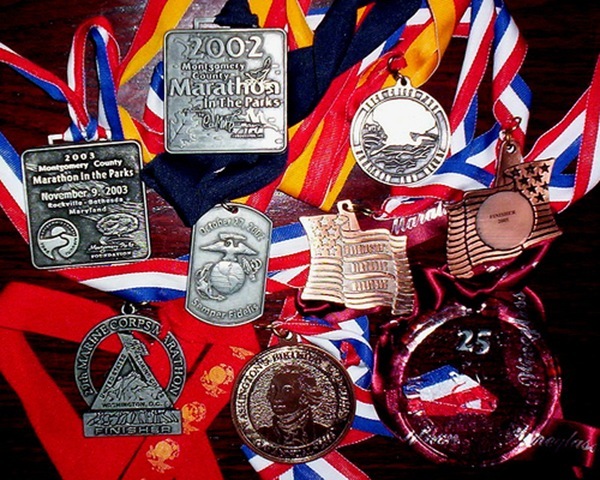 My medals remind me of the humility required to run marathons. My first was in 1993 in Columbus, Ohio. That day was nearly perfect. With only a 15 mile training run, I started the race with a protective naiveté that I’ve never had since. I didn’t know that I wasn’t prepared, I didn’t know what to expect, and I had no particular plan. It is still my fourth fastest marathon. I see the medals from Chicago and Marine Corps in 1997, the “year of the double,” when I ran the two races on consecutive weekends. 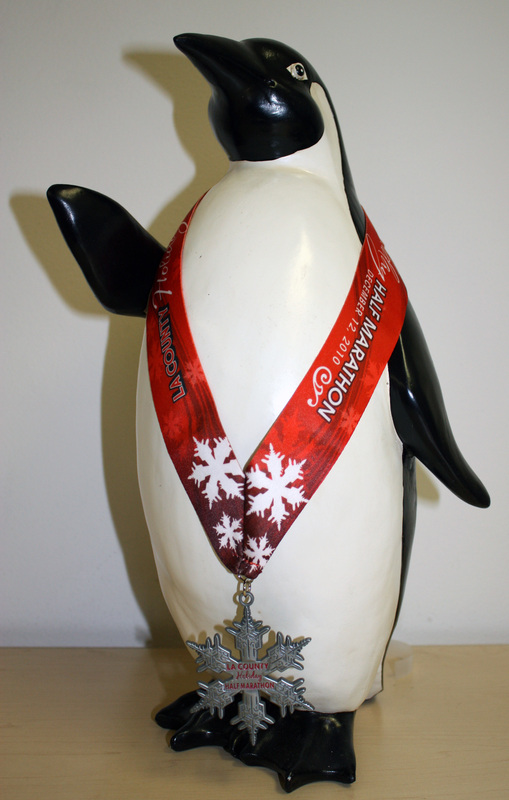 The idea of running two marathons in two weeks ranks very high on the list of “stupid Penguin tricks.” What’s most interesting, in retrospect, is that I ran the fastest 10K of the two races at the end of the second marathon. By then I was tired of running and just wanted it to be over. Then there are the medals from London for 1998, 1999, and 2000. It’s the only race I’ve completed three times, the one that has the most emotional connections for me. I’ve always run London with a combination of joy and sorrow. The medals from the half marathon in Florence, Italy, are hanging there too. Firenze is where I learned how good a banana and hot tea can taste during a race, and just how lost you can get when you lose sight of the runners in front of you and can’t speak the language. That doorknob holds memories of the good and the bad days, of people who brought great inspiration into my life and then faded away. There are memories of cities and streets and steps taken toward a finish line that never really seems to be the end. Sometimes I think my medals deserve a place of greater distinction. I think I should display them where others can see them. Then I remember why I wanted those medals in the first place. I wanted them not to show to anyone else, but as reminders of my own journey as a runner and as a person. Like my son’s rotini wreath, I will prize them not for what they are, but for what they mean to me. I love this post. My medals simply hang off whatever is most convenient as I unpack. They are priceless. It’s all about the meaning behind them, and not so much the prestigious display.